Barbour Medium Thornproof Tarras Bag in olive..
10 ounce waxed canvas tarras bag, in olive green with Barbour tartan lining. Solid brass buckles and strap fittings, with solid brass net ring on side. Adjustable cotton webbing shoulder strap. Two large bellows pockets with press stud front fastenings. 36cm x 10cm x 29cm. 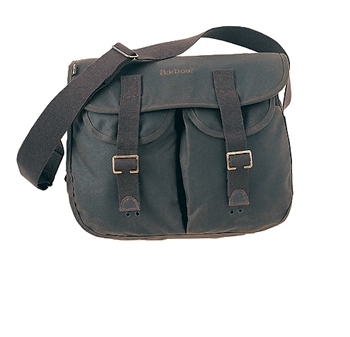 This tarras bag is the ideal gift for the shooting sportsman or any lover of the countryside.SALE! This is a Barbour tailored, pure cotton, terry towelling rain choker. Sadly Barbour now only makes the rain choker in olive green. The Barbour Rain Choker is folded and sewn into corners at either end and makes an ideal gift for the serious outdoor sportsman. Rain chokers or rain cravats stop that nasty feeling of rain trickling down the back of the neck. Size 125cm x 16cm.